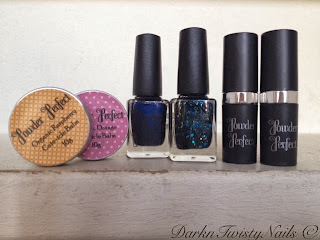 A few weeks ago, I stumbled across an indie make-up brand and fell in love! 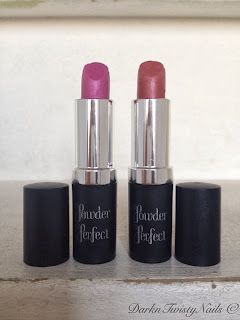 Powder Perfect is an Australian brand, created bij Jacinta. They create handmade cosmetics from luxury ingredients. Their products include organic lipstick, cuticle balm and nail polish. 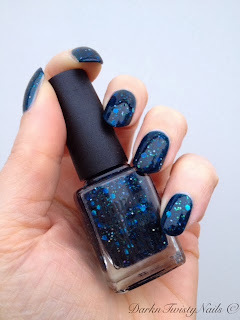 Of course I was all over the nailpolish, but due to the harsh shipping conditions on nail polish, Powder Perfect doesn't ship polish internationally. I had my hart set on a polish, so I contacted Jacinta and as she was more than happy to help me out. She let me know she was willing to ship polish to me, but only at my own risk, which I think is fair enough. So I placed my order. I have to say, the shipping costs were extremely reasonable and I was stunned at how fast it arrived at my doorstep. I placed on order on a Monday and I received my package 8 days later, just 8 days from Australia to Europe! Now that's impressive! 2 Cuticle balms, 2 nailpolishes and 2 lipsticks. I absolutely love the packaging. Simple but playfull. I especially think it's funny that I ordered 2 cuticle balms, Raspberry and Orange and that my raspberry is actually in the orange packaging and Orange is in the pink packaging. The lipsticks are organic and vegan and they are extremely creamy. I love how they feel on my lips, rich and soft and I think they actually hydrate my lips. These lipsticks are nicely pigmented, but a little on the sheer side for me since my lips are quite dark. I apply just one good layer when I go to work and add a couple of layers to intesify the color for my evening look. Dark Paradise is a magenta lipstick with a purple undertone, perfect for pale skinned people like myself. Fireside is a brick red lipstick. It reminds me of fall leaves and I think it's the perfect fall color. I have been wearing this non stop since I got it, I just can't get enough! 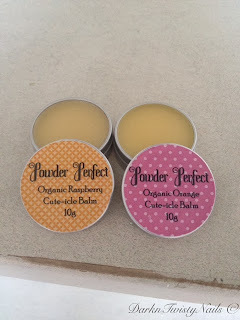 The cuticle balms are called Cute-icle balms for a reason. Just look at them, aren't they the cutest things you've ever seen? They come in silver tins, with a cute colored sticker. I have 2 scents and I really like them both. I can't stop sniffing my hands when I've applied them. They feel rich and buttery and do a good job at keeping my cuticles nice and soft. And now for the, in my book, main attraction: the nailpolish! I have just one for you today, Downworlder (the other one and the raspberry cuticle balm are for a friend of mine, so unfortunately I have to part with those...). Downworlder is part of the Shadowhunter collection and is a blue jelly base filled with blue, teal and silver glitters and hex holo glitter. 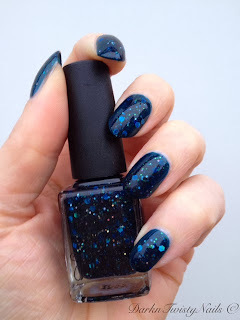 The hex holo glitter makes it look like you're under water, so gorgeous! The formula is spot on. 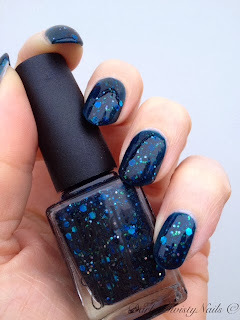 No need to fish for glitter, they come out easily and distribute evenly on the nail. This polish is opaque in just 2 coats and dries really fast. 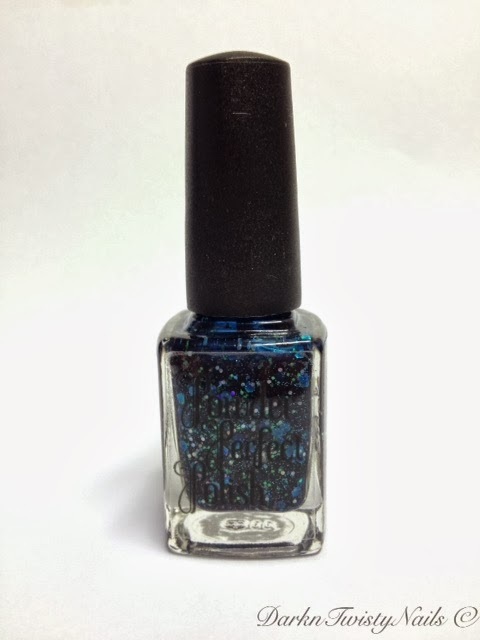 It does dry a little on the dull side, as most glitters tend to do, but that is easily fixed with a shiny top coat. The brush is very nice to work with, it looked a little shorter than the average brush, but it didn't give me any problems, it made glitter application very easy. Overall, I'm very impressed and am allready thinking about my next order. Powder Perfect has some really nice Halloween polishes that I'm dying to get my hands on, I would definitely recommend checking out the Etsy store, website or Facebookpage. Are you familiar with this brand and what is your favorite "undiscovered" indie brand? Yes, it is! I'm in love with it and it has such a nice formula.